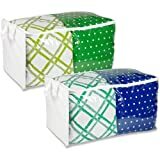 This Closet Storage Bag 2-Pack Jumbo PEVA – Honey Can Do #SFTZ01419 is a great alternative to vacuum storage bags. This jumbo storage bag is perfect for seasonal storage as well as blankets & comforters. Constructed of clear PEVA with white breathable sides is kind to your items and allows you to see what is in the bag. Granted it will not fit under you bed, but if you have the room for storage, this bag is a must have! This entry was posted on Wednesday, August 10th, 2011 at 10:30 pm	and is filed under Quilt Items. You can follow any responses to this entry through the RSS 2.0 feed. You can leave a response, or trackback from your own site.